Bernoulli's principle can be used to calculate the lift force on an airfoil, if the behaviour of the fluid flow in the vicinity of the foil is known. For example, if the air flowing past the top surface of an aircraft wing is moving faster than the air flowing past the bottom surface, then Bernoulli's principle implies that the pressure on the surfaces of the wing will be lower above than below. This pressure difference results in an upwards lifting force. [d] Whenever the distribution of speed past the top and bottom surfaces of a wing is known, the lift forces can be calculated (to a good approximation) using Bernoulli's equations – established by Bernoulli over a century before the first man-made wings were used for the purpose of flight. Bernoulli's principle does not explain why the air flows faster past the top of the wing and slower past the underside. See the article on aerodynamic lift for more info. ^ If the particle is in a region of varying pressure (a non-vanishing pressure gradient in the x-direction) and if the particle has a finite size l, then the front of the particle will be ‘seeing’ a different pressure from the rear. More precisely, if the pressure drops in the x-direction (dp/dx < 0) the pressure at the rear is higher than at the front and the particle experiences a (positive) net force. According to Newton’s second law, this force causes an acceleration and the particle’s velocity increases as it moves along the streamline... Bernoulli's equation describes this mathematically (see the complete derivation in the appendix). ^ Acceleration of air is caused by pressure gradients. Air is accelerated in direction of the velocity if the pressure goes down. Thus the decrease of pressure is the cause of a higher velocity. ^ The idea is that as the parcel moves along, following a streamline, as it moves into an area of higher pressure there will be higher pressure ahead (higher than the pressure behind) and this will exert a force on the parcel, slowing it down. Conversely if the parcel is moving into a region of lower pressure, there will be a higher pressure behind it (higher than the pressure ahead), speeding it up. As always, any unbalanced force will cause a change in momentum (and velocity), as required by Newton’s laws of motion. ^ a b c d e f g Clancy, L. J. (1975). Aerodynamics. Wiley. ISBN 978-0-470-15837-1. ^ a b c d e f g h Batchelor, G. K. (2000). An Introduction to Fluid Dynamics. Cambridge: University Press. ISBN 978-0-521-66396-0. ^ Streeter, Victor Lyle (1966). Fluid mechanics. New York: McGraw-Hill. ^ Denker, John S. (2005). "3 Airfoils and Airflow". See How It Flies. Retrieved 2018-07-27. ^ Resnick, R. and Halliday, D. (1960), section 18-4, Physics, John Wiley & Sons, Inc.
^ Mulley, Raymond (2004). Flow of Industrial Fluids: Theory and Equations. CRC Press. pp. 43–44. ISBN 978-0-8493-2767-4. ^ a b Chanson, Hubert (2004). 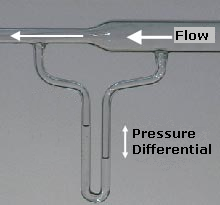 Hydraulics of Open Channel Flow. Elsevier. p. 22. ISBN 978-0-08-047297-3. ^ Oertel, Herbert; Prandtl, Ludwig; Böhle, M.; Mayes, Katherine (2004). Prandtl's Essentials of Fluid Mechanics. Springer. pp. 70–71. ISBN 978-0-387-40437-0. ^ "Bernoulli's Equation". NASA Glenn Research Center. Retrieved 2009-03-04. ^ White, Frank M. Fluid Mechanics, 6th ed. McGraw-Hill International Edition. p. 602. ^ Clarke, Cathie; Carswell, Bob (2007). Principles of Astrophysical Fluid Dynamics. Cambridge University Press. p. 161. ISBN 978-1-139-46223-5. ^ Landau, L.D. ; Lifshitz, E.M. (1987). Fluid Mechanics. Course of Theoretical Physics (2nd ed.). Pergamon Press. ISBN 978-0-7506-2767-2. ^ Van Wylen, Gordon J.; Sonntag, Richard E. (1965). Fundamentals of Classical Thermodynamics. New York: John Wiley and Sons. ^ a b c Feynman, R.P. ; Leighton, R.B. ; Sands, M. (1963). The Feynman Lectures on Physics. Vol. 2. ISBN 978-0-201-02116-5. ^ Tipler, Paul (1991). Physics for Scientists and Engineers: Mechanics (3rd extended ed.). W. H. Freeman. ISBN 978-0-87901-432-2. , p. 138. ^ Feynman, R.P. ; Leighton, R.B. ; Sands, M. (1963). The Feynman Lectures on Physics. Vol. 1. ISBN 978-0-201-02116-5. ^ Thomas, John E. (May 2010). "The Nearly Perfect Fermi Gas" (PDF). Physics Today: 34. ^ Eastlake, Charles N. (March 2002). "An Aerodynamicist's View of Lift, Bernoulli, and Newton" (PDF). The Physics Teacher. 40 (3): 166–173. Bibcode:2002PhTea..40..166E. doi:10.1119/1.1466553. "The resultant force is determined by integrating the surface-pressure distribution over the surface area of the airfoil." ^ Glenn Research Center (2006-03-15). "Incorrect Lift Theory". NASA. Retrieved 2010-08-12. ^ Ison, David (1 July 2006). "Bernoulli Or Newton: Who's Right About Lift?". Plane & Pilot Magazine. Retrieved 2018-07-27. ^ Phillips, O.M. (1977). The dynamics of the upper ocean (2nd ed.). Cambridge University Press. ISBN 978-0-521-29801-8. Section 2.4. ^ Lamb, H. (1993) . Hydrodynamics (6th ed.). Cambridge University Press. ISBN 978-0-521-45868-9. ^ Weltner, Klaus; Ingelman-Sundberg, Martin. "Physics of Flight – reviewed". "The conventional explanation of aerodynamical lift based on Bernoulli’s law and velocity differences mixes up cause and effect. The faster flow at the upper side of the wing is the consequence of low pressure and not its cause." ^ "Bernoulli's law and experiments attributed to it are fascinating. Unfortunately some of these experiments are explained erroneously..." Weltner, Klaus; Ingelman-Sundberg, Martin. "Misinterpretations of Bernoulli's Law". Department of Physics, University Frankfurt. Archived from the original on June 21, 2012. Retrieved June 25, 2012. ^ "Bernoulli's Principle states that faster moving air has lower pressure... You can demonstrate Bernoulli's Principle by blowing over a piece of paper held horizontally across your lips." "Educational Packet" (PDF). Tall Ships Festival – Channel Islands Harbor. Archived from the original (PDF) on December 3, 2013. Retrieved June 25, 2012. ^ "If the lift in figure A were caused by "Bernoulli principle," then the paper in figure B should droop further when air is blown beneath it. However, as shown, it raises when the upward pressure gradient in downward-curving flow adds to atmospheric pressure at the paper lower surface." Craig, Gale M. "Physical Principles of Winged Flight". Retrieved March 31, 2016. ^ Eastwell, Peter (2007). "Bernoulli? Perhaps, but What About Viscosity?" (PDF). The Science Education Review. 6 (1). ...air does not have a reduced lateral pressure (or static pressure...) simply because it is caused to move, the static pressure of free air does not decrease as the speed of the air increases, it misunderstanding Bernoulli's principle to suggest that this is what it tells us, and the behavior of the curved paper is explained by other reasoning than Bernoulli's principle. ^ Eastwell, Peter (2007). "Bernoulli? Perhaps, but What About Viscosity?" (PDF). The Science Education Review. 6 (1). An explanation based on Bernoulli’s principle is not applicable to this situation, because this principle has nothing to say about the interaction of air masses having different speeds... Also, while Bernoulli’s principle allows us to compare fluid speeds and pressures along a single streamline and... along two different streamlines that originate under identical fluid conditions, using Bernoulli’s principle to compare the air above and below the curved paper in Figure 1 is nonsensical; in this case, there aren’t any streamlines at all below the paper! ^ "Bernoulli’s theorem is often obscured by demonstrations involving non-Bernoulli forces. For example, a ball may be supported on an upward jet of air or water, because any fluid (the air and water) has viscosity, which retards the slippage of one part of the fluid moving past another part of the fluid." Bauman, Robert P. "The Bernoulli Conundrum" (PDF). Professor of Physics Emeritus, University of Alabama at Birmingham. Archived from the original (PDF) on February 25, 2012. Retrieved June 25, 2012. ^ "In a demonstration sometimes wrongly described as showing lift due to pressure reduction in moving air or pressure reduction due to flow path restriction, a ball or balloon is suspended by a jet of air." Craig, Gale M. "Physical Principles of Winged Flight". Retrieved March 31, 2016. ^ "This demonstration is often incorrectly explained using the Bernoulli principle. According to the INCORRECT explanation, the air flow is faster in the region between the sheets, thus creating a lower pressure compared with the quiet air on the outside of the sheets." "Thin Metal Sheets – Coanda Effect". University of Maryland – Physics Lecture-Demonstration Facility. Archived from the original on June 23, 2012. Retrieved October 23, 2012. ^ "Although the Bernoulli effect is often used to explain this demonstration, and one manufacturer sells the material for this demonstration as "Bernoulli bags," it cannot be explained by the Bernoulli effect, but rather by the process of entrainment." "Answer #256". University of Maryland – Physics Lecture-Demonstration Facility. Archived from the original on December 13, 2014. Retrieved December 9, 2014.